It is true that I am partial to anything “Olsen.” The twins are two of my favorite celebrities and their clothing lines are to die for! 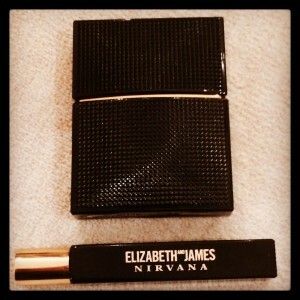 However, Ashley and Mary-Kate’s new fragrance, Nirvana Black, by Elizabeth and James is legitimately good. I get compliments on it every time I wear it. Of course, I have my signature scents but this is a solid one to have on stand by when it comes time to mix things up a bit. Nirvana Black is a blend of warm notes – violet, sandalwood, and vanilla balancing both your masculine and feminine side. Stylist Tip: Fragrance is a very personal thing. Wear what you love! Make choices that suit your personality and nose. Do not worry about trends or what’s new on the market when it comes to perfume.